What's the Best Tool for Instagram Scheduling? Adding new posts to Instagram during your coffee break is fine. Sort of. What about adding posts to Instagram at a time of day when your target market is likely to actually be using Instagram? That’s a much better idea. So, you’ve switched to an Instagram business account. Great work. You’ve looked at your audience data to figure out what time of day, per day of the week, they’re using the app. Fantastic. But you know you’re not likely to be able to post your content because at those times. Why? Well, that’s not when your coffee break is. You’re going to need some sort of app or service that will allow you to schedule your thumbstopping Instagram content at the right time. There are loads of apps and web services that will enable you to do this. But which ones are best? This guide is here to help with that! In this video I take you through my experiences with 3 services I’ve used for Instagram scheduling. Sprout Social. MeetEdgar. Buffer. And from the 3 I make my pick of the best. Each of the 3, of course, allows you to set up a posting schedule for Instagram. Multiple Instagram accounts, even. Over and above that, each gives you the ability to plug in multiple social network accounts, from Facebook Pages and Groups, to LinkedIn Company Pages. Pricing is definitely a factor when choosing the best service for Instagram scheduling. Of the 3 I tried, Sprout Social is the most expensive, coming in at around £75 - $99 - per month, per user. That’s quite steep, right? I used it for several years. I really liked it, especially the reporting function, where I can produce branded PDF report for each plugged in social network account. It’s a nice touch, and it trumps both MeetEdgar and Buffer. But is it worth £75 a month? Probably not. When it came to scheduling for Instagram, it wasn’t the best, as I explain the video above. For power users who manage several social media accounts across different social networks, its certainly worth a look. MeetEdgar has some nice touches that I really enjoyed. Such as importing content from RSS feeds (remember them?). This means you can easily syndicate content from blogs straight into your content posting calendar. Assign this content a category, tell the software which social network to post it to, and you’re ready to go. I was even able to bring in videos from YouTube playlists using the RSS import feature. This is a function I haven’t seen available on any other scheduling software or app. Perhaps the best feature from MeetEdgar is the calendar. It’s simple to create a posting scheduling within this part of the software and you can see, at a glance, what’s being posted to which social network throughout the week. I also enjoyed the “auto variation” feature. MeetEdgar would look at the content I was posting, such as a blog post, and auto-generate the text that would appear on a Facebook post or tweet based on the content of the blog post. Sadly, it lacks any sort of detailed reporting functionality. But price-wise, it’s around £36 - $45- per month. What about MeetEdgar’s Instagram scheduling? Again, I didn’t find this particularly usable, as outlined in my video above. 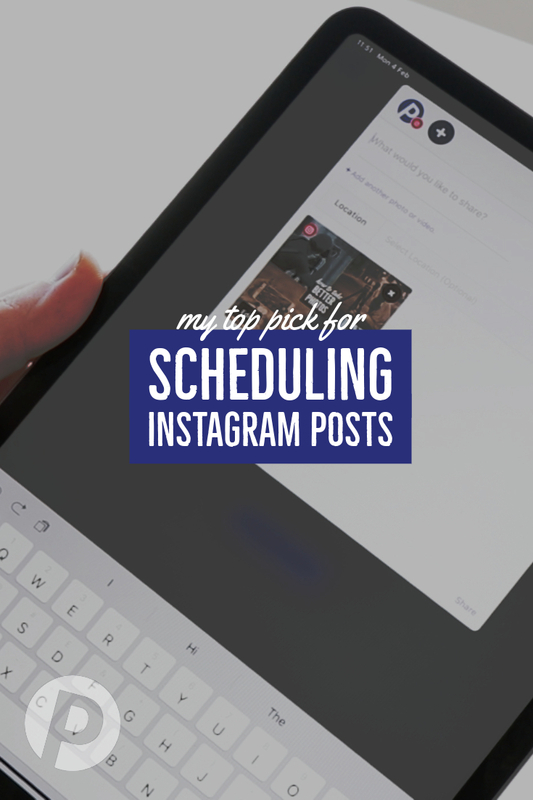 What’s the Best Tool for Scheduling Instagram Posts? Of the 3, Buffer is the service I now use for managing all of the social networks in my stable, both for Postable and for my clients. And the main reason for this is how well it handles Instagram scheduling. Currently Buffer doesn’t offer any reporting features, but they’ve told me this is on the way. And this is great news. But you do need a Business account on Buffer. Which brings me to price. To manage up to 5 social media accounts, Buffer is free. To take advantage of its forthcoming analytics and reporting functionality, you’ll need a Business Account, which gives you 10 social media accounts and costs around £19 - $25 - per month. So, not only does Buffer have a free option - the other two don’t - it’s more affordable, it’s the best app, in my opinion, for scheduling Instagram posts, it’s also adding reporting and analytics to the service very soon. If you’re not setting up ways to maximise your business’s exposure on Instagram this year, you’re probably not recognising how important Instagram is going to be in 2019, which I’ve written about here. Of course, you sometimes need another pair of eyes on your strategy for Instagram, maybe even some help in creating one. I’m here to help with that, it’s one of my specialities. Find out more about my Instagram consultation. Let me know your thoughts on scheduling apps and services in the comments section, and if you’ve found this guide helpful, I’d love it if you SHARED it with your friends and colleagues! Newer PostThumbstopping Content - What is it and Why Do You Need it?